You’ve thought about the wine in your cooler throughout the day - the only thing that made your office hours bearable. Finally home, you’re already dreaming of pouring yourself a well-deserved glass of celebratory booze. But your wine’s hot! How could that happen? Here are six reasons your wine fridge is not cooling and how to fix it. 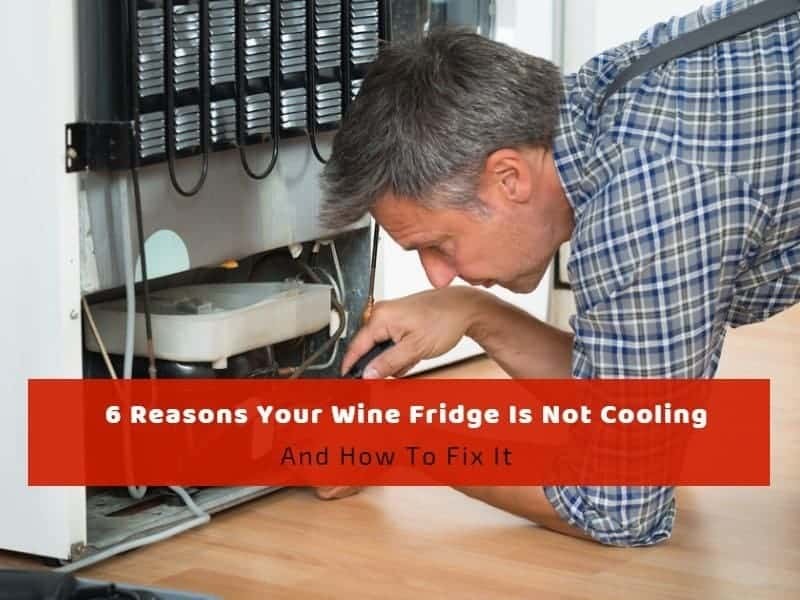 Jumping on to troubleshooting as quickly as possible seems the best thing to do when your wine fridge is not cooling, but before getting your hands dirty, take a moment to analyze the type of appliance you have. Based on the technology employed, wine coolers use either a compressor or a thermoelectric system to keep the air inside the cabinet cold. Compressor units work just like a regular fridge, and if they’re not cooling, something’s wrong. But thermoelectric units are not necessarily broken. Before jumping to conclusions that your thermoelectric cooler is defective, you should learn its limitations. Influenced by the environmental temperature, a thermoelectric cooler will not work effectively if the room temperature is too hot. These wine fridges work best at ambient temperatures from 50°F to 80°F. Exceed this on the upper limit, and your appliance will not be able to keep your wine fresh. With this in mind, let’s see the main reasons your wine fridge is not cooling and how to fix it. A compressor cooling system comprises four elements, one of which is a fan designed to cool down the condenser and condenser coil. This component turns on with the entire system, and when it doesn’t, the condenser and coil may overheat. In the long run, this will provoke heat transfer from the elements of the system to the interior of the cabinet, warming it up together with all your delicious wine. Make sure the condenser fan is spinning freely and that it’s not obstructed by anything. Dust and debris may build up and stop the blades from spinning. If no dust or debris is obstructing the fan movement, the fan is most probably broken, and you’ll have to replace it. For the DIY lovers out there, this is typically easy to do by just unscrewing the nuts holding it and removing the assembly from the motor section. Replace the old fan with a new one, and your wine fridge should start cooling again. The cold air you feel when opening the door of your compressor wine fridge comes from the evaporator. This component pulls the air from the coils and cools down the interior of the cabinet. If the evaporator doesn’t work, the unit will not be able to produce cold air even if the compressor runs at full capacity. Since the evaporator also uses a fan, the reason for its malfunction can be a blockage. Sometime, the blades of the fan could bend due to the accumulation of dust and debris, and that’s another reason why the wine fridge may not be cooling. Check out the evaporator and see if there is ice built on it. Also, check if the blades of the evaporator’s fan are in good condition. Dust and debris could have also built up on the component. Troubleshooting is easy. If there is ice, let it melt down before plugging in the appliance. Clean any dust and debris and make sure nothing obstructs the correct functioning of the evaporator. Also, make sure the bent fan is replaced with a new one promptly. If your compressor wine fridge is not cooling, one of the reasons might be a defective thermostat. This component is responsible for the supply of power to the condenser, evaporator fan, and compressor. The thermostat also allows you to control and adjust the temperature of your wine fridge, and if this essential component doesn’t work, your wines might get spoiled. While in most cases a defective thermostat will warm up the interior of the cabinet, there are cases when it cools it down below the freezing threshold. A defective thermostat can’t be repaired; you’ll have to replace it altogether. The user manual and online tutorials explain how to do it, but my advice is to always call in a technician. This is a delicate procedure that can bring further damage to your wine fridge if performed incorrectly. Thermoelectric wine fridges use Peltier modules to conduct heat out of the cabinet. And while they are greener and more effective in keeping the wine sediment undisturbed, they are less effective in maintaining a low temperature. This happens because the thermoelectric wine fridges don’t come with a refrigerant system. If the environment is too hot, the Peltier module becomes ineffective in cooling the interior. That’s why it is recommended to place a thermoelectric wine fridge in an environment where the room temperature doesn’t exceed 75°F. If your thermoelectric wine fridge is not cooling because the room temperature is too hot, there is good news. Your unit is not defective. Indeed, this doesn’t mean your wines will be preserved at the right temperature. The easiest way to fix it is by moving the fridge into a cooler room, perhaps turning on the A/C in the hotter days. The room temperature is just right, the thermostat and ventilator work entirely, but your thermoelectric wine cooler is just not cooling? Check out it has proper ventilation. Because of the way it conducts heat out of the system, a thermoelectric wine fridge needs clearance from the surrounding objects. A quick fix solution to this issue is to ensure proper ventilation. Make sure the wine fridge is positioned away from walls and other objects. Never built in a thermoelectric wine cooler and never place anything on top of it. If you have a countertop unit, make sure it’s located away from other appliances that generate heat, such as a microwave or toaster oven. Like most refrigerators, thermoelectric wine fridges also have a fan that conducts hot air out of the cabinet. Due to the different technology, the fan of a thermoelectric unit can easily disconnect. Just like in case of a compressor wine cooler, the fan can also be obstructed by dust and debris, or it may simply break and need replacement. If your wine fridge is not cooling and you’ve ruled out room temperature and position, inspect the fan. Make sure it is connected properly and clean. If disconnected, simply attach the right connectors to the motherboard to troubleshoot. If the fan is dirty, clean any dust and debris and make sure the system is not clogged. A vacuum cleaner or mild blower can help in this regard. There are multiple reasons why your wine fridge is not cooling. Troubleshooting starts with the identifying the type of fridge you have. Compressor and thermoelectric units use different technologies. Therefore the causes of their malfunctions are completely different. While a thermoelectric fridge may not cool your beverage for trivial reasons that have nothing to do with malfunctions, troubleshooting a compressor unit is much more complicated. When a compressor fridge is not cooling, it means something’s broken. It could be a quick fix or something that requires more investigations, but more often than not, you’ll have to call a technician in. That said, you now know a few good reasons why your wine fridge is not cooling and how to fix it.